We are a diverse and dynamic multi-disciplined group of motivated and creative problem-solvers. Together, the r6catalyst team embodies a fusion of characteristics that includes being radical, inspirational, skilled and optimistic; fun, flexible, and young of mind. But most importantly, we are ethical, tolerant and hardworking. The principals of r6catalyst, with decades of entrepreneurial, management and corporate experience, started the firm with the core vision of assisting business enterprises increase their capabilities and capacity, and evolve into sustainable businesses. Each project we undertake and every client we work with has unique needs. Hence, our network of resources comprises an enviable list of subject-matter experts with real-world experience who share our vision and philosophies. r6catalyst drives transformative results by delivering strategic business management consulting, marketing, leadership development and training, and process improvements to substantially enhance an organization’s competitive positioning and operational excellence. The firm is a certified M/W/DBE. Each project we undertake and every client we work with has unique needs. Each project we undertake and every client we work with has unique needs. We engage in a focused and tactical application of best practices and lessons learned, bringing in subject-matter experts to lend expertise in solving our clients’ problems. We believe in partnering and continuously collaborating with our clients and guiding them to achieve real results. Engage the client continuously throughout a project lifecycle. Understand and define issues, challenges, and outcome. Analyze systems and processes, ensuring alignment with corporate aspirations. Develop innovative solutions tailored to client’s needs. Delivery within precise timelines and budget. Our interconnected services gives us the ability to look at the bigger picture, unravel challenges at various touchpoints within an organization, and deliver management, marketing and operational excellence. A holistic roadmap for the future of any business enterprise is comprised of key strategic components including organizational capabilities, resources, intrinsic strengths, integrated marketing techniques, adaptive use of technology, and innovation. By working collaboratively with you, we help identify challenges, and opportunities. We work towards the bigger picture, without losing sight of details. Our goal if to help guide your decision making, set and achieve realistic goals, and enable to you advance and transform your business on sound fundamentals and sustainable strategy. 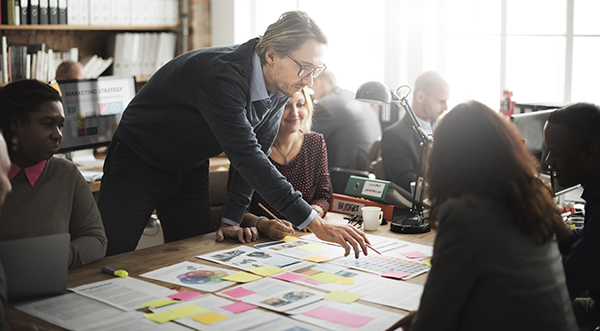 The r6catalyst team has expertise in creating business and growth plans, developing agile processes, and conducting visioning workshops and internal leadership training. We have achieved a high level of success in identifying, planning, and developing tactical business development pursuits and proposals for various clients. Marketing is the engine to boost your business. A strategic marketing plan constitutes detailed research, goal-setting, budgeting and creative tactics. Data-driven research, customer and market trend analysis, and our insights will inform your marketing decisions. Together, with your executive leadership team, r6catalyst will assist in developing a customized plan that identifies your potential target customers and business opportunities, and revitalizing your messaging to reach your audiences. Your brand represents the core of your business. Our experts are adept at grasping the essence of your business and weaving it into engaging and consistent messaging, with various touchpoints, to create a compelling brand experience for your various stakeholders. We have worked with a number of organizations in creating their corporate personas and identity, designing digital (websites) and print media, developing crisp communications and presentations, tactical marketing using social media and advertising, as well as organizing and managing events. To advance, leadership in a business must work together and move in the same direction. This is especially essential during change and flux. Our charter is to help businesses evolve; r6catalyst provides executive management training programs to align individual goals with overall company goals. Well-developed and implemented training programs on business vision, project management, corporate identity, communications and technology, facilitate performance improvements, positive change, and business growth. Over the years, r6catalyst has coached business owners and leaders through sponsored mentoring and technical assistance programs. Our goal is to empower them to evolve, accomplish real results and succeed. We believe that mentoring is the central and critical component of small business growth and development. Our turnkey approach uses proprietary techniques, involves developing deep understanding of individual business needs and challenges, assessing skills, custom training program development, and continuous evaluation and measurement. Technological systems play a significant role in simplifying processes. For a business to advance, people, processes and technology must be aligned to move forward together in a collaborative manner. r6 ties best practices with today’s most relevant technologies to drive comprehensive and future-proof solutions. Every business has different technology adoption maturity levels. Our technology specialists develop optimal technology plans aimed at providing maximum impact to businesses, across various functional areas including project management, marketing and business communications, networking and operational systems, and back-office software tools. The principals of r6catalyst, with decades of entrepreneurial, management and corporate experience, started the firm with the core vision of assisting business enterprises increase their capabilities and capacity, and evolve into sustainable businesses.